What, you were expecting the marshmallow kind? These lovely Buff Orpingtons are five weeks old. I brought them home yesterday, having finally finished painting and outfitting the chicken tractor. Good thing it has wheels, because I rolled it all over the ranch trying to decide the best and safest place to put it. Until I change my mind again, the chickens will call the garden home. As for what to call them, in keeping with the theme begun with Deets' arrival, I present the ladies of Lonesome Dove. Oh my, the Easter bunny has gone organic! They are adorable! Oh, they are so CUTE and I LOVE their names! Have fun with them! I wonder if they will lay brightly colored eggs ;-) looking forward to watching them grow. This is fantastic, new little babies and fresh eggs to come. The chicken tractor turned out great! My Dad always told me to never name my cows. He didn't say anything about chickens though. Love love love baby chicks! I have Buffs and they are great hens. Happy Easter to all of you. How cute! Used to have chickens but after moving here; not a good idea. What I truly love are Guinea Fowl, but we are too close to the road and coyotes live on the abandoned railroad bed behind us. Not a good idea at all!! Pretty soon, the only thing you'll need from Walmart is the occasional battery. I know I'll enjoy your new babies vicariously. Perfect names. Watch for hawks and coyotes and hmmm...Deets. So cute and will most likely provide you with some perfect eggs one day! 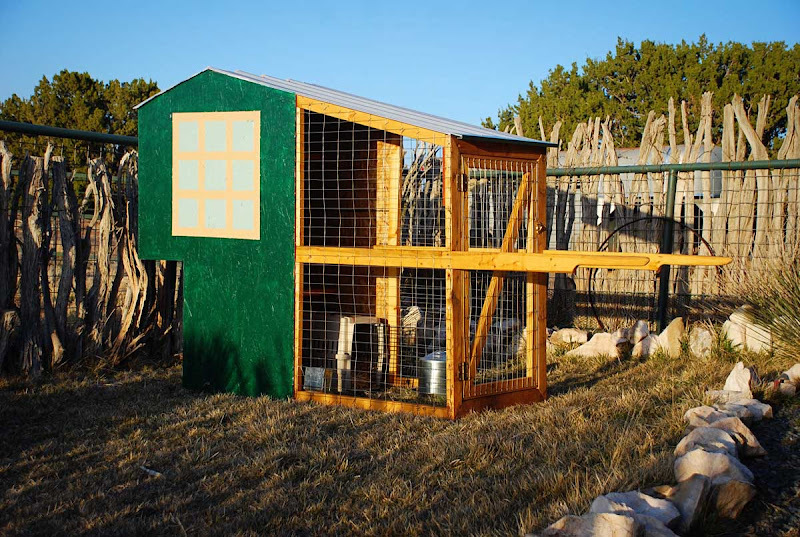 Congrats - the chicken coop paint looks fab! Lonesome Dove - one of my all time favourite books. Your new babies are so cute! Looking forward to watching them grow. chickens! You got chickens! I'm so jealous. I'm just getting around to finding a level spot where I can build/place a chicken house. And find an eager 4-Her who wants to help me with this project. Love the Ladies of Lonesome Dove. Does that mean we'll soon be seeing two new burros named Woodrow and Augustus? I love buff orpingtons. Mine was a very sweet bird. Chickens are wonderful. Congratulations! Will love to see these cuties grow. And my, do they have a nice house! It is Deetsproof, right? Ehehe how cute! I always wanted chickens but mum tells me the story of my grandfather when they moved over here from the US and bought a farm. He decided he wanted to become a farmer so he bought 5$ worth of 1 cent chicks expecting more than half to die. If you do the math you can imagine how many chickens they ended up with. Only about 5 died of natural causes and my mom had to singe the feathers and pluck them out and my aunt had to gut them. My mom still doesn't like omelette's but can cook a mean one. I'd completely forgotten about your plan to keep chickens! What an awesome Easter gift. Sweet, sweet, sweet. Awwwwww! These are my kind of Peeps! So very happy for you Linda! Just 23 more weeks and you'll be enjoying green chile breakfast burritos courtesy of your Lonesome Dove ladies! Oh...They are really so sweet! 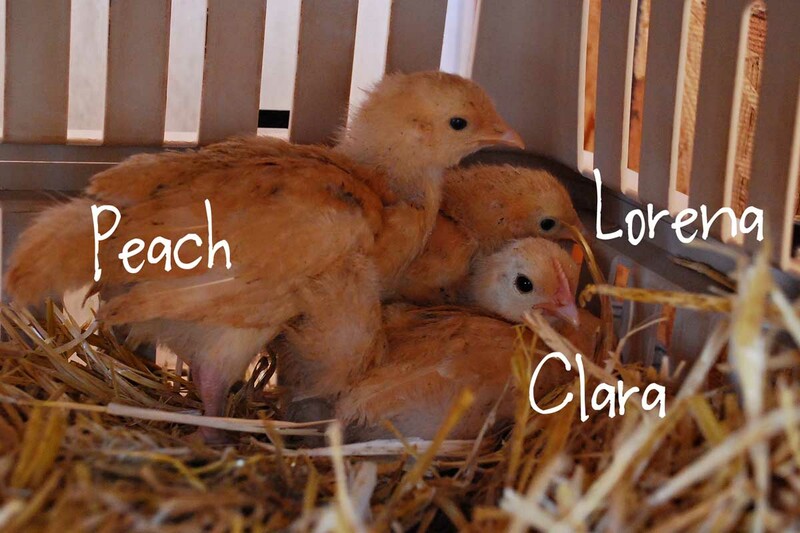 Dear little Chicks for Easter and I love that you named them with Lonesome Dove names....How great that you can move the "coop" around as needed....! They are so cute. Our feed stores are advertising them right now and I get so tempted but I don't have a secure place and we have too many burrowing critters to protect them living as close as we do to a creek. Still I want them again someday and Buffs are my favorites. Good luck with those babies. I can almost hear Gus, "Lori, darlin'. Cut the cards." Now if that isn't the nicest little chicken coupe I've ever seen. The handles remind me of a vehicle I rode in on the streets of Bangkok, only I think it was called a tuk tuk. It's great to see you adding to the furry friends. Be careful if you add a rooster. They can get pretty nasty. Ah ha! Happy Easter, Carson and good luck with the new babies. I'm late to the party, but HOORAY! Buff Orps are the best. Love the names. My newest Buff Orp girls are named after the characters in The Secret Life of Bees. Hehe, the names are perfect! I was out on walk with my Dad today and I stopped to photograph some birds. I heard a soft clucking noise and there were two chickens staring at me from the undergrowth. They belonged to the farmer in the field behind the hedge. A few yards further on we found a broken hen's egg that had obviously been someone's breakfast :). Adorable and love their names. Happy Easter! I love what you did with the chicken tractor ... a lot of work went into getting it prepared. 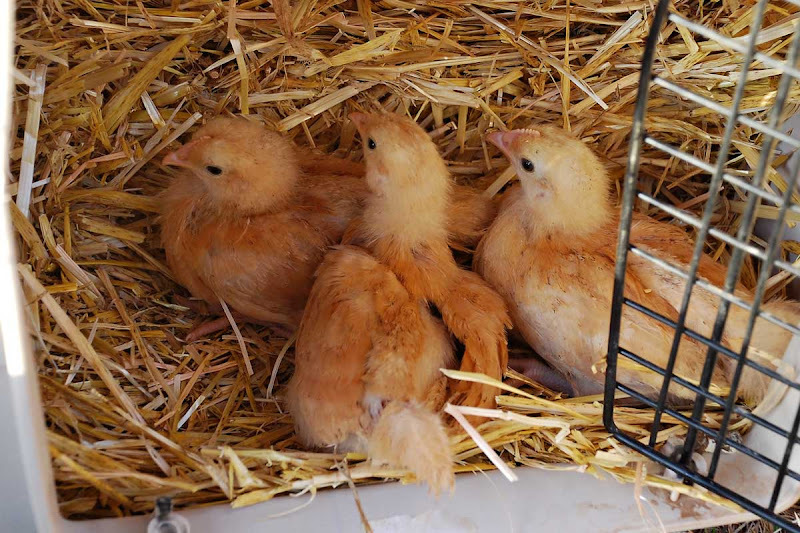 Good choice on your chicks ... you will be more then pleased with them when they're grown and laying. Beautiful! 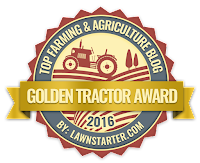 The freshly painted tractor, the sun shining on it, your THREE new chick babies, everything is beautiful! I hope you enjoy your chicken journey as much as I (and no doubt many, many of your readers) have. Precious little darlings!! Have fun with them. Welcome home ladies! I look forward to many new adventures. Awww, they are too cute! I love the names :) Love their house too, that is the coolest! The chicken tractor is a great idea!! I love the wheelbarrow handles! The new header photo is great too, happy Spring! Look at those cuties - congratulations! I am sure you will enjoy them and I can't wait to read about their adventures at 7MSN! They're darling. I miss having chickies around, pecking at the bugs, clucking excitedly when they lay an egg. I know you want to protect them from marauders, but you'll find they'll need more exercise than the space in the tractor will give them. Maybe a portable fence could move around with them so they can stretch their chickie legs? What a lovely chicken house! Love also the names Peach, Loreba and Clara. It's so beautiful the green wall with the design of the windows! One of my favorite movies, ever. I always wondered about Deets name, but hadn't searched out the answer.